See you down the puddle! Puddling in butterflies. 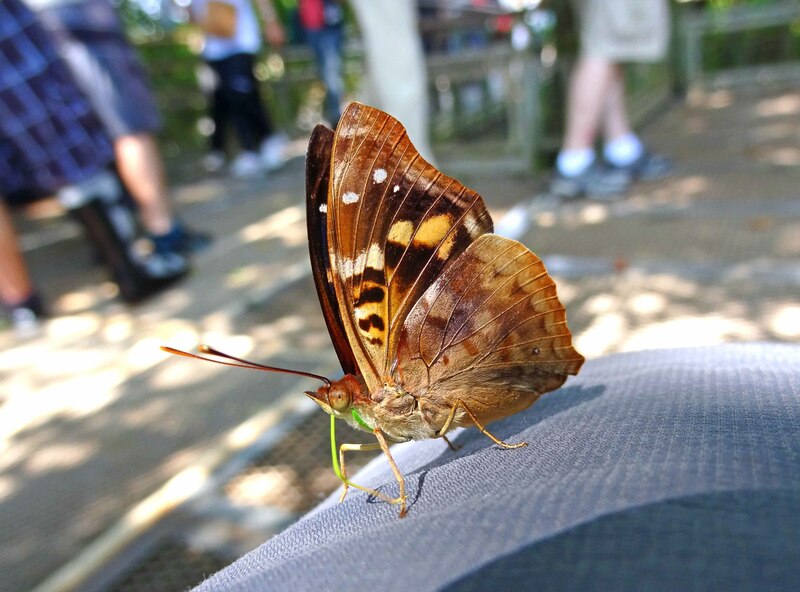 Turquoise (Doxocapa agathina vacuna) puddling on my jeans! 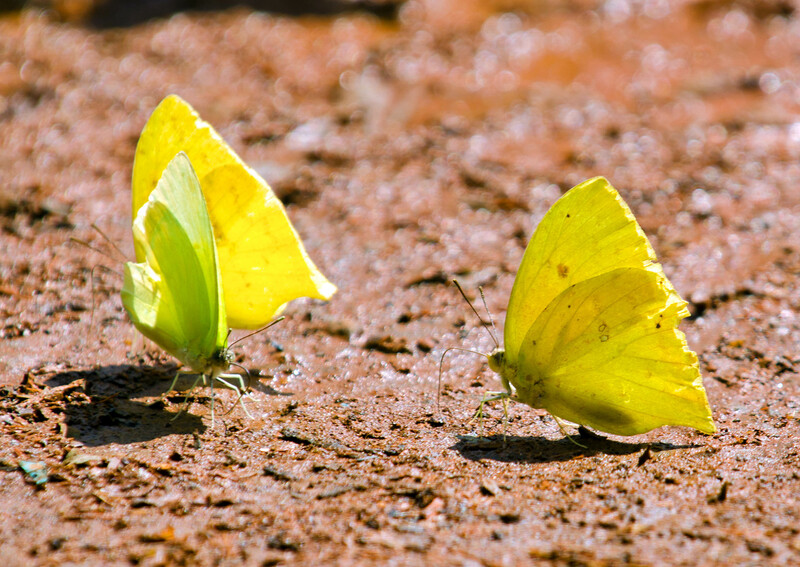 ‘Puddling’ or ‘mud-puddling’ is when butterflies, moths and other insects settle on moist substrates to absorb liquids. 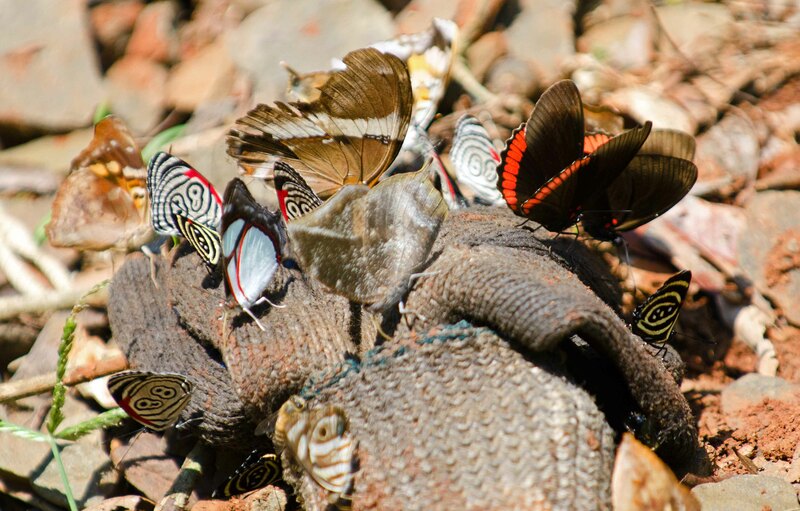 Butterflies – particularly in the tropics – exhibit this puddling behaviour when feeding on moist ground, mud, animal excrement, rotting fruits, carrion, dung, bird droppings, sweat, tears and so on. Common Redring (Pyrrhogyra otolais) mud puddling on mud! One might think that puddling butterflies are just having a drink, but it turns out to be a bit more complicated than that. For one thing, in butterflies at least, most of the individuals seen puddling are young males; females are rarely seen puddling, although it has been recorded in some older individuals. What puddling butterflies are doing is making up for the chemicals or nutrients they lack as a result of deficiencies in their diet as larvae. So puddling is a way of imbibing the salts and micronutrients they need when they become adults and start mating. Butterflies need to stock up on both sodium (the Na in NaCl; sodium chloride or salt) and nitrogen (in the form of amino acids; the building blocks of proteins) because when they mate they will transfer substantial amounts of sodium and protein to the females in the form of a ‘spermatophore’. A spermataphore is a large – up to 10% of body mass in some butterflies like the Monarch – capsule of sperm and essential nutrients. 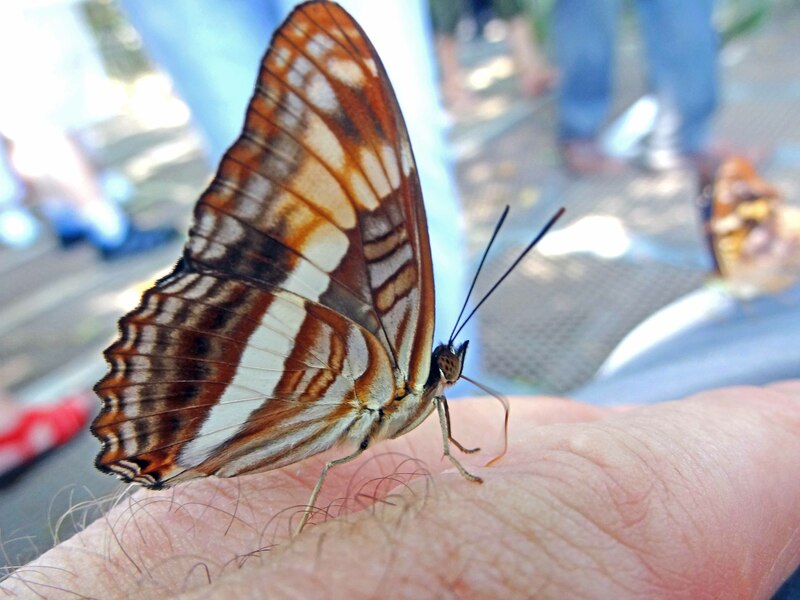 Female butterflies lose a huge amount of their body salt – up to 75% – as a result of egg laying, so the male is in effect providing her with a gift; a so-called ‘nuptial gift’ of nutrients which he has obtained via puddling. Providing the female with resources for her to use for making eggs, can be seen as the male’s contribution towards the process of reproduction. A sort of division of labour between the sexes: he spends time and energy obtaining and then passing on to her what she needs to produce their fertilised eggs. The quality of the nutrients in the spermatophore which the male provides to the female may therefore, improve her fertility and give their offspring the best chance in life (i.e. increase their fitness). So puddling is a very important activity in the life of an adult male butterfly to obtain sufficient salts and nutrients to pass on in this way. 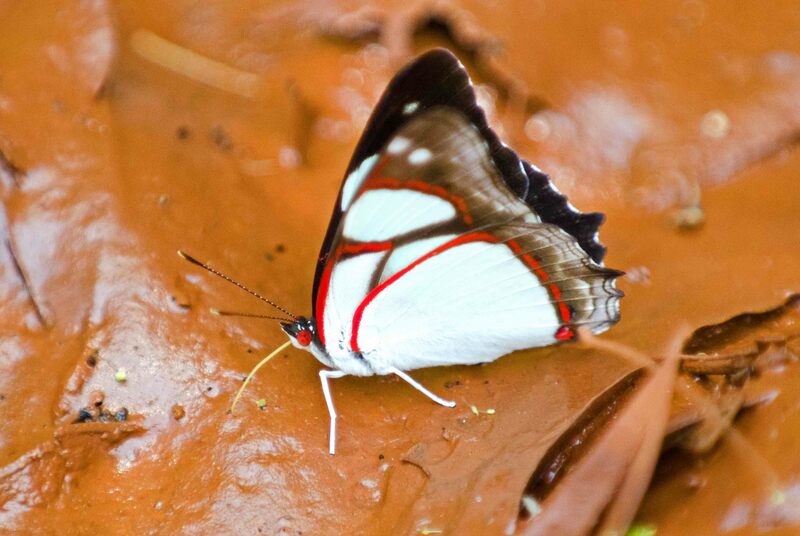 Butterfly species differ with respect to what particular substrates they prefer to puddle on! Some species are more attracted to mud, others prefer dung and so on. Some species become specialised on one type of substrate – such as carrion – and presumably become highly adept at finding what they need. 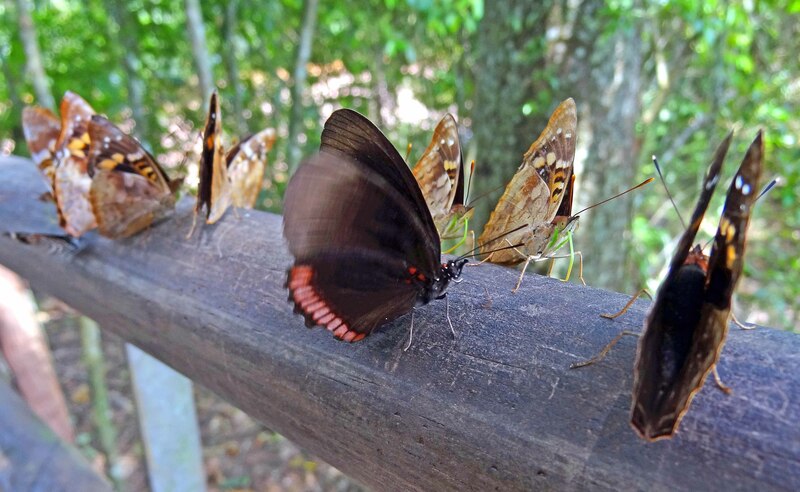 A source of nitrogen is very important for many butterflies, so puddling on dung and carrion is a good way of obtaining proteins as well as salts. 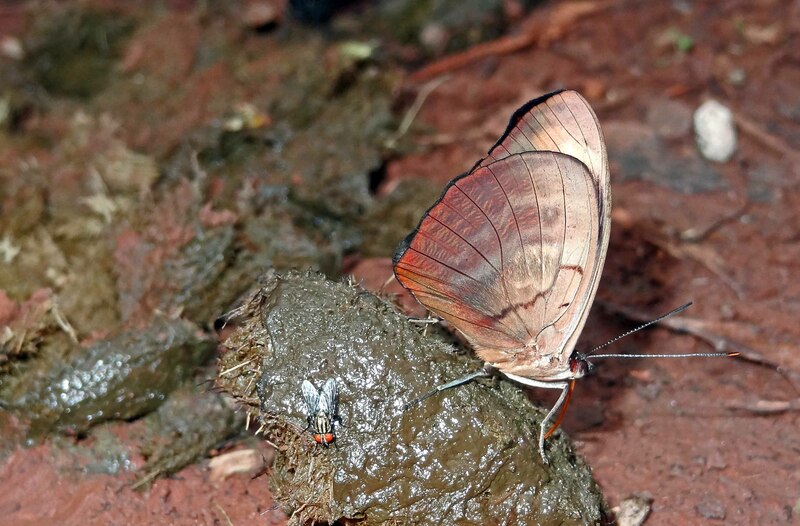 Unidentified South American butterfly puddling on some fresh dung! Some aggregations of butterflies seen next to streams may simply be imbibing water; especially in the tropics where temperatures are so high. 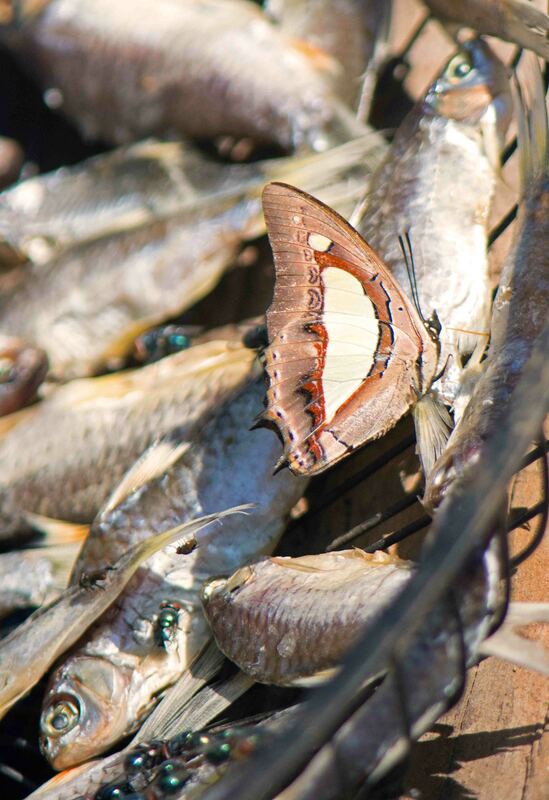 An aggregation of male swallowtail butterflies of the species Papilio polytes, was even seen drinking seawater at low tide, on the island of Guam. 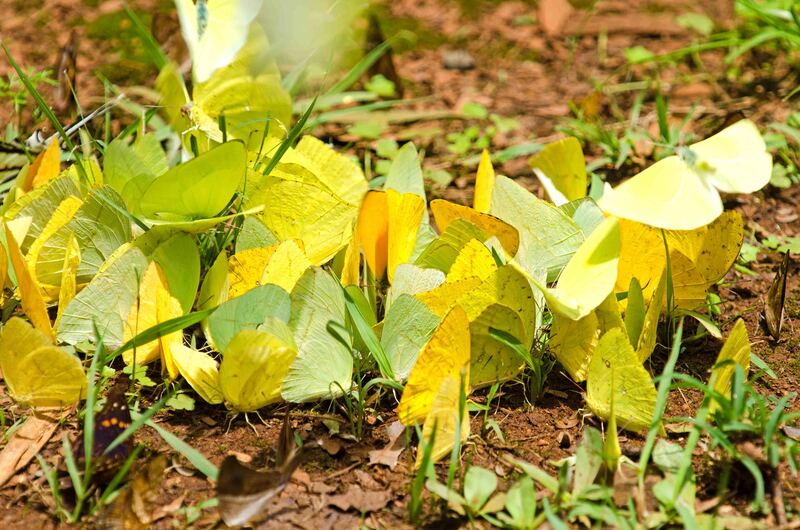 Many butterflies – including papilionids (swallowtails) and pierids (yellows and whites) – form large aggregations when puddling, which might be a way of minimising their exposure to predation, via safety in numbers. There is no doubt an awful lot more to learn about what individual species are obtaining by puddling on different substrates and how this contributes to their success in reproduction. It comes down to insects getting what they need from their environment to best survive and perpetuate themselves. Butterfly puddling on my sweaty finger! 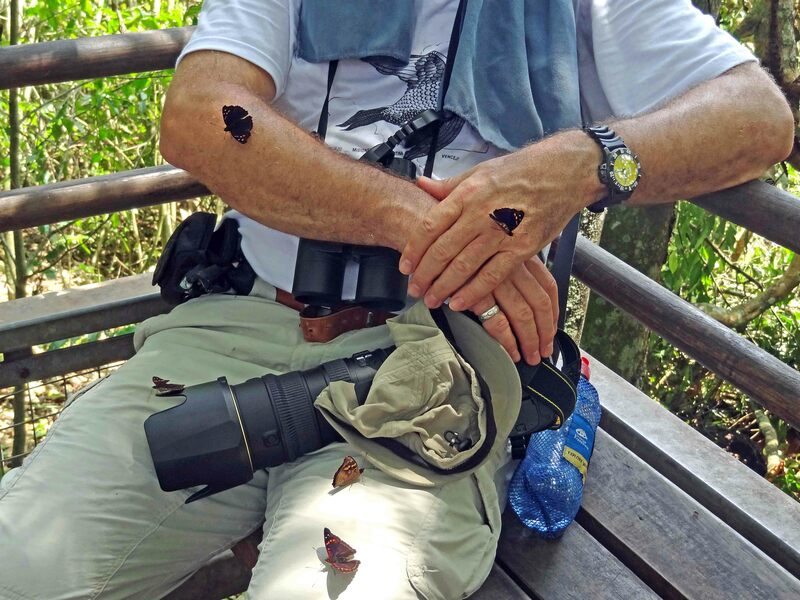 The author as a sweaty substrate source for puddling butterflies! Boggs, C. L., & Jackson, L. A. (1991). 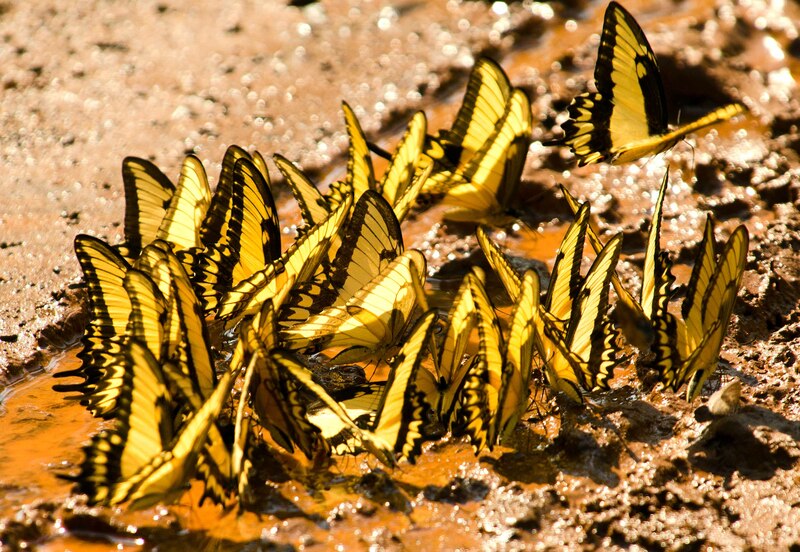 Mud puddling by butterflies is not a simple matter. Ecological Entomology16(1), 123-127. Scriber, J. M. (2002). 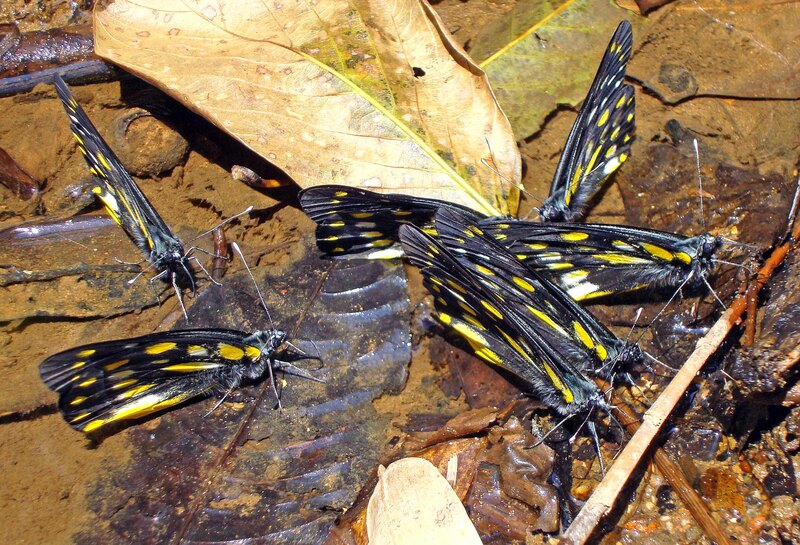 A female Papilio canadensis(Lepidoptera: Papilionidae) puddles with males. The American midland naturalist 147(1), 175-178. Otis, G. W., Locke, B., McKenzie, N. G., Cheung, D., MacLeod, E., Careless, P., & Kwoon, A. (2006). Local enhancement in mud-puddling swallowtail butterflies (Battus philenor andPapilio glaucus). Journal of Insect Behavior 19(6), 685-698. Oberhauser, K. S. (1988). Male monarch butterfly spermatophore mass and mating strategies.Animal behaviour 36(5), 1384-1388. Molleman, F. (2010). Puddling: from natural history to understanding how it affects fitness.Entomologia experimentalis et applicata, 134(2), 107-113. Beck, J., MuÈhlenberg, E., & Fiedler, K. (1999). 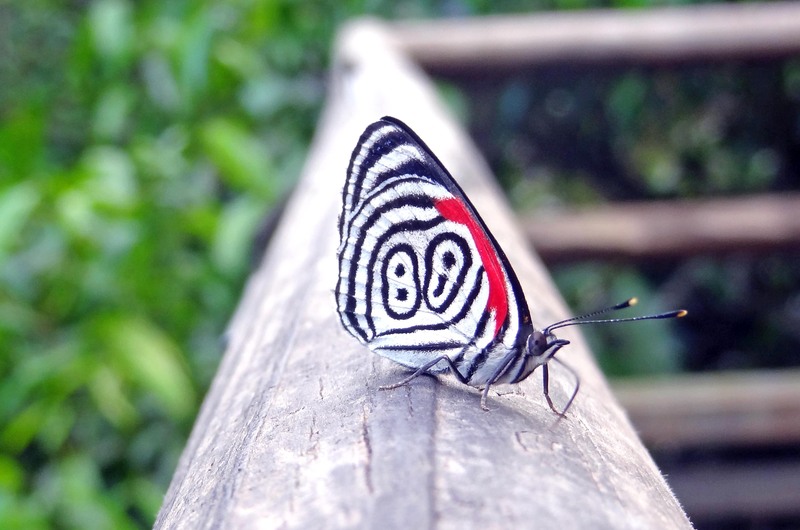 Mud-puddling behavior in tropical butterflies: in search of proteins or minerals?Oecologia 119(1), 140-148. Ray Cannon's nature notes See you down the puddle! Puddling in butterflies.